Nicole's Needlework: CaHRH Block 12 Finished! I got block #12 finished last night. 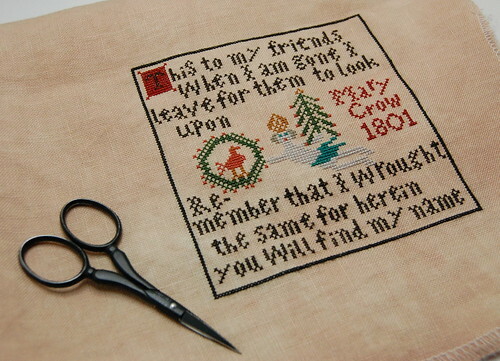 I was going to personalize it (put my name instead of Mary Crow), but I liked the idea of it looking like an old fashioned sampler, so I left it. 40 ct. Vintage Examplar, NPI silks. This block will take me much longer because it's solid stitching. It's one of my favorite blocks though - I love the ship. Well, I also got a little bit more birthday stash yesterday (it's the never ending birthday - LOL). I couldn't resist getting a couple new Christmas things from Down Sunshine Lane, especially since Amy offers a birthday discount! 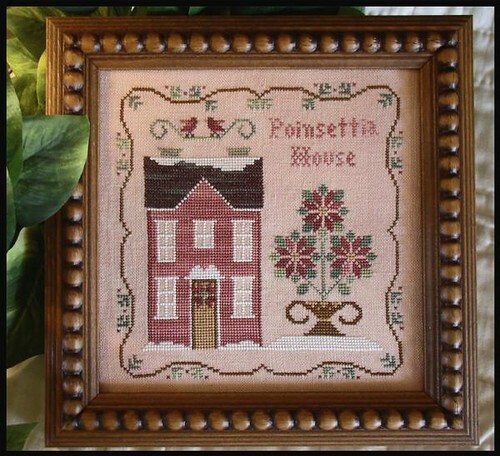 Little House Needleworks "Poinsettia House"
It's not even a never-ending Birthday, yet! In my family, we celebrate with a "Birthday Week". :D So, you get to acquire presenty stash for at least until Monday. :D Then, you'll have to go back to stashing just for the heck of it! Are you going on to block 11, or working on something else? Your stitching is lovely as usual Nicole! Lovely stitching. I love your new stash especially Poinsetta House - it's one I'd like as well. Wonderful new stash - I love your choices! And, Block 12 is beautiful - great stitching! That finished block looks great. I am in love with CaHRH. Look forward to seeing your wonderful progress. And a Very Happy Belated Birthday!! Your block for CWaHRH is so pretty! I also love your new stash! I got Holly and Ivy at the quilt festival I went to.. 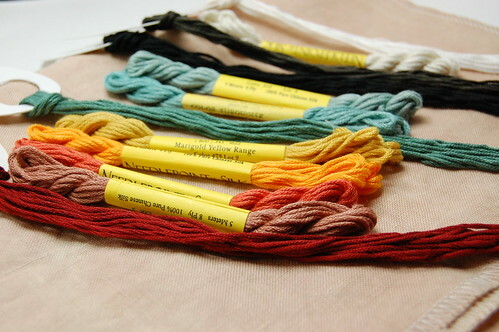 The colors on CaHRH are so pretty and your stitching is awesome! Congrats on your Block #12 finish! I can't believe how much you get stitched. And good for you on the never-ending Birthday. That stash looks great and even if you don't start on it right away, it will be waiting for you (along with a lot of other things, I'm sure! LOL). Can't wait to see your progress on #11. Happy Birthday! Love the progress on CaHRH and the colors on your newly acquired stash! Enjoy! 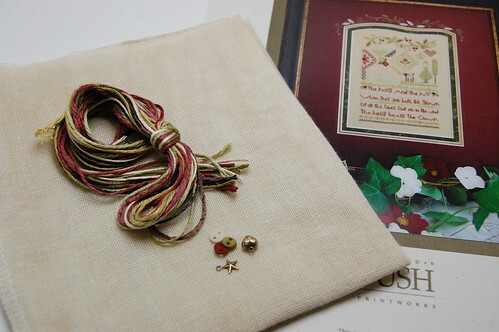 Wonderful stitching. Can't wait to see the next block. Ha! Finish it by Christmas next year, my foot. You're aiming for Christmas 2009, young lady, admit it! Congrats on getting that first block under your belt. NO WAY! Do you not eat or sleep? That's beautiful, Nicole. Absolutely, positively beautiful. The colors are just beautiful for the CaHRH. I've been going back and forth on the LHN piece. Very tempting. Woo hoo... you've got a block finished already... that's great Nicole. I'm so happy you decided to start CaHRH. I'm looking forward to following you progress and seeing this piece in all its glory. Don't you just love stringing out the birthday for days on end? Smart women! Love all your B-day stash and that first or 12th block...Fabulous! I've seen the first 2 in person that a friend is stitching! It is so fabulous! Wonderful finish ! I'm going to love watching your progress on this one. Great job on block #12!!! Can't wait to see more progress on this one! Happy belated birthday!! Great stash and I love the first block of CaHRH! Great new start and great new stash. Wow, YGG Nicole! I love your first block-it's wonderful! I think that is one of my favorite blocks--I just love the verse. Good for you on the new stash!